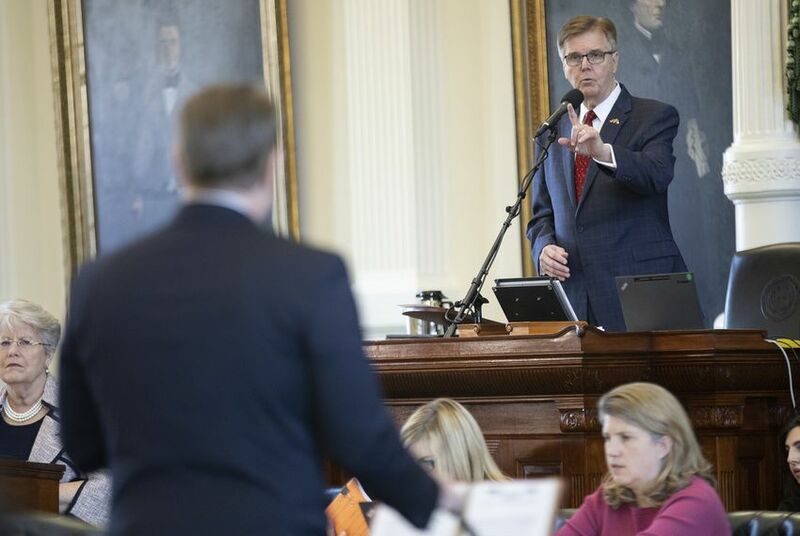 The Texas Senate broke a logjam Monday that had paralyzed a piece of priority legislation for weeks — blunting a controversial provision in a property tax reform package and then advancing the bill without having to deploy a procedural “nuclear option" to move it. Seliger’s announcement came alongside a reworked bill that was unveiled Monday with a handful of technical changes and one notable concession. As updated, SB 2 will force cities, counties and other taxing entities to receive voter approval before raising 3.5% more property tax revenue than the previous year — a change from the 2.5% trigger originally proposed. School districts would still face the 2.5% threshold under the version of the bill approved Monday. Revenue generated on new construction does not count toward the threshold. And small taxing units, with sales and property tax levies under $15 million annually, will need to opt into some of SB 2’s provisions in elections. And when state Sen. Beverly Powell, D-Burleson, described the possible effects of SB 2 on her local cities and counties, it prompted the author of the legislation, Sen. Paul Bettencourt, R-Houston, to respond, "This is where my teddy bear becomes a grizzly bear." Her amendment was not adopted. After three hours of debate, SB 2 passed on an 18-13 vote, with Seliger joining the upper chamber's Democrats in opposition. It was then given final approval on an 18-12 vote — with Sen. Eddie Lucio Jr., D-Brownsville, voting present — and will be sent to the House for further debate. "That was lost," he explained later. What he could preserve, however, was the "reputation of the Texas Senate" as a deliberative and collegial body. He voted to allow the bill to be debated, averting the need for the nuclear option, and criticized Patrick for even floating the idea in a lengthy speech on the Senate floor. “We have a way to do things that I think is important. It underscores that we must be willing to compromise,” said Seliger, an Amarillo Republican who has clashed with Patrick in the past. He suggested GOP lawmakers had urged him to help bring SB 2 to the floor, regardless of whether he later voted "no" on the bill's substance. The most recent draft of SB 2 reins in increases to school district tax rates using language that appears similar to what was in the original version of the bill — language Bettencourt’s office once referred to as a placeholder. According to the business-backed Texas Taxpayers and Research Association, the provision would allow school districts to increase their tax rates without voter approval, as long as the rate increase was less than 2.5%. Currently, school districts must go to voters if they raise taxes above $1.04 per $100 valuation, up to the maximum $1.17. “An initial attempt at a one-size fits all solution was included in HB 2 and SB 2 as introduced — but however well-intentioned, the school language didn’t work,” Dale Craymer, the association's president, wrote in a critique of the bill. He has said the House's school finance legislation, which would lower school district tax rates statewide, provides "both tax relief and tighter constraints on future tax increases." Speaking to reporters after SB 2 was given preliminary approval, Bettencourt said the bill tackled the "most important issue that the state is facing this legislative session" and represented a "historic step." He and other proponents of the measure often note that the current rollback rate of 8% was set during a period of high inflation during the late 1970s and never revisited. Patrick, meanwhile, reiterated the need for property tax reform and seemed to stand by his threat to use the nuclear option. "When you run for office, you tell the people what you're going to do and then you go do it," he said. "That's a statesman. You don't get tangled up in some procedures and practices that the people back home don't know about or don't care about. What they want is tax relief, and my job as lieutenant governor is keeping my promise to the people." Seliger, the Republican senator, said he has alternate legislation that would help reduce property taxes, including by capping the rate at which appraisals grow — a proposal Abbott seems to have shown support for. The state's top three leaders have also backed a plan to use a 1-cent sales tax increase to lower property taxes.